Citrix XenDesktop on Nutanix is a powerful solution that offers ideal user experience, simple administration, and web-scale flexibility and economics. Citrix XenDesktop on Nutanix is a powerful solution that offers ideal user experience, simple administration, and web-scale flexibility and economics. Citrix XenApp transforms desktops and applications into a secure, on-demand service available to any user, anywhere, on any device. Nutanix has been validated to take both solutions to another level, providing benefits such as unlimited scalability, data locality, streamlined management, reduced rollout time, lowered costs, increased denisity and more. 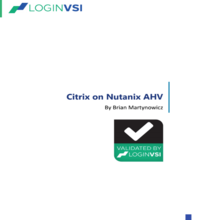 Download this 3rd party white paper for detailed performance and configuration information about the cluster’s ability to scale when used for XenDesktop and XenApp deployments, as well as recommendations for designing, optimizing, and scaling Citrix XenDesktop and XenApp deployments on Nutanix AHV.